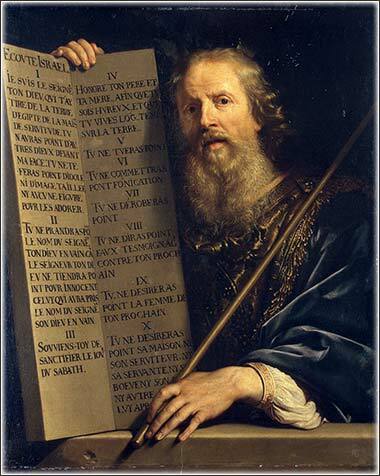 Moses with the Ten Commandments. This masterpiece by Rembrandt (ca. 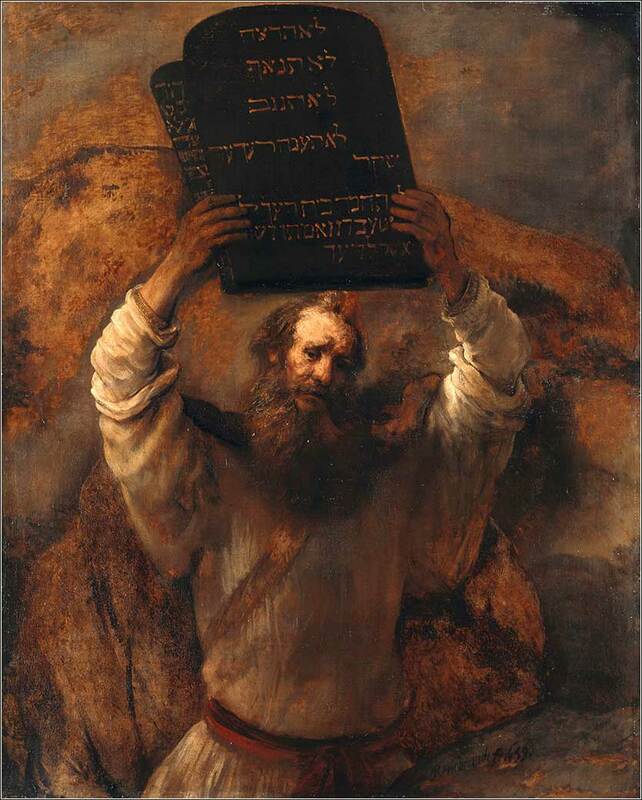 1659) captures Moses’ greatness, in his moment of despair when he first sees the golden calf. Saturday is Oldies Day, and this one should bring a smile to your face. Then Moses went up from the plains of Moab to Mount Nebo, to the top of Pisgah, which is opposite Jericho. And the Lord showed him all the land, Gilead as far as Dan, all Naphtali, the land of Ephraim and Manasseh, all the land of Judah as far as the western sea, the Negeb, and the Plain, that is, the Valley of Jericho the city of palm trees, as far as Zoar. So Moses the servant of the Lord died there in the land of Moab, according to the word of the Lord, and he buried him in the valley in the land of Moab opposite Beth-peor; but no one knows the place of his burial to this day. Moses was 120 years old when he died. His eye was undimmed, and his vigor unabated. And the people of Israel wept for Moses in the plains of Moab thirty days. Then the days of weeping and mourning for Moses were ended. It seemed fitting to end our reading of Exodus with that last chapter of Deuteronomy. Moses is not permitted to enter the Promised Land because of an insult to Yahweh. (The nature of his offense, recounted in Numbers, is not completely clear. (Numbers 20)) But although his leadership of the Hebrews ends at the Canaan frontier, the magnitude of his life is not diminished by it. There was, truly, no other prophet of God to equal him until the coming of Christ. In fact, if one were an atheist and read the Bible, one would have to credit Moses with inventing Judaism and, thus, Western morality. It would make him the greatest legal mind in history and, with the exception again of Christ, the most brilliant ethicist, for the law he transmitted to the Jews is still followed, to the letter, by many people today, and forms the moral foundations of most of the civilized world, outside greater Asia. His religious teachings were the basis of not only Judaism, but also Christianity and Islam. Both Christ and Mohamed quoted him (or if you are a believer, the Word of God given to him) for moral principles. His name occurs over 500 times in the Koran. And if that were not remarkable enough, Moses' extensive integrated religious and civil code did not evolve from centuries of scholarship and argument, as, say, the philosophies of Greece 1,000 years later. His writing had almost no intellectual foundation. It was cut from whole cloth, for it resembled nothing else in the world. Does your belief in God, or the Bible, ever waiver? If so, consider the likelihood that Moses, a struggling shepherd living in the middle of nowhere, could have accomplished this by himself. Even assuming he was the recipient of a decent education by the standards of 1400 B.C., the Egyptians were intellectually primitive. Writing had just been invented. Monotheism was practically unheard of; the greatest religious minds of the world were worshiping things, such as statues with the head of a jackal, or burning babies inside statues of Moloch. Philosophy did not exist. The very concept of modern morality did not exist. To illustrate this, consider that the Romans, the world's most advanced civilization until the Renaissance, did not conceive that taking a human life might be “wrong”, per se. The most credible explanation for Moses' astonishing achievement is the one given in Exodus itself: Moses was the great prophet of the one true God; and Exodus was transmitted through him, not created by him.